You’ve probably walked past this place and never even noticed it. It’s on the 3F of a tall building right on the corner of DaAn and ZhongXiao East Road intersection (大安忠孝東路路口). I’ve yet to visit Korea myself, but every time I see Toppoki on a menu my eyes light up. So, seeing the yellow, purple, green, original, different shaped and different length toppoki here just blew my mind. A few of each to start. I’ll be back for more later! The yellow ones are carrot, the purple ones are purple rice, and the green ones are Asian mugwort . These are also a type of Toppoki, just a slightly different style. These things are weird, there’s no sugar coating that. I thought it was intestine, but on closer inspection it seems that they are the really popular Korean street snack Eomuk/odeng (어묵(오뎅)). This street food is a style of fishcake, made by blending a variety of seafood into a paste and then either making it into a sausage-like shape, or what you can see here. There are a lot of sauces on offer here. My suggestion: try them all – why not? In the foreground there are some delicious deep-fried fish bites, and in the background you can see some gyoza-like fried dumplings. Dunk these into the broth and let it soak it up – delicious. If the masses of instant noodles offered up in the packages aren’t your thing, then pick up a ‘brick’ of noodles from here. Fried rice station. After your hotpot is finished, leave some residue to make a wicked fried rice sauce. Then, get a bunch of these ingredients and slap them in with a bowl or two of rice. …and of course a shed load (there was more than 1 plate of this, btw). The cylinders on either end are small maki sushi-like deep fried bites – yes please! Idiot proof instructions including lots of informative pictures. We told the server that we wanted a little spice, but not too much 小辣 (xiǎo là). We were possibly a little worried about getting it too spicy (Koreans like SPICY food), and this suited us quite well. You could taste the spice, without it being overpowering and mouth-watering spice. By the time we had come back to our seats after collecting our ingredients to pop into the hot pot, our broth was already bubbling away and smelling great. After perusing the food on offer in the ‘all you can eat’ section, we decided to buy an extra portion of beef. However, I won’t be doing it again. In a hot pot you need some fatty meat, this was too lean and too chewy. 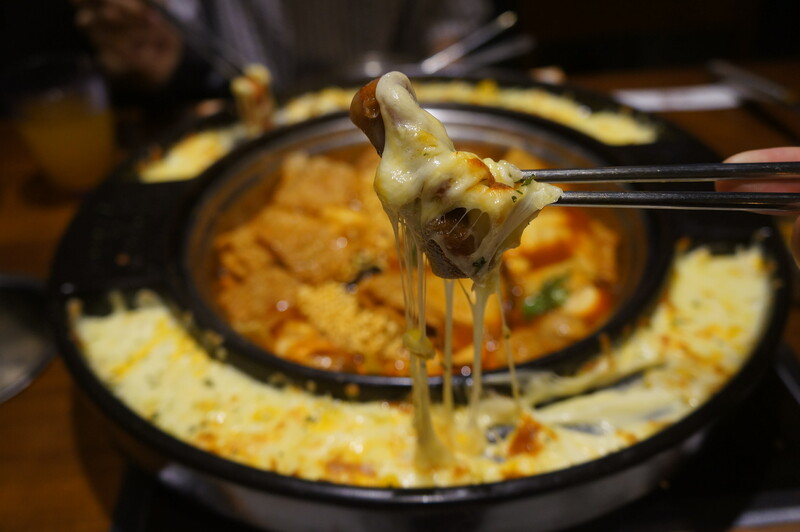 Oh, by the way, we also ordered melted cheese to dip everything into – TGIF! I wasn’t a huge fan of this. The texture was quite chewy and there wasn’t a huge amount of flavour (maybe it was lost in the cooking process). Remember when you’re finished everything in the hot pot, to leave some of the residual broth in the bottom. Get your other fried rice ingredients ready. We were recommended to add the pork in first. The rice was OK, the kimchi was pretty good, and the corn added nice pops of sweetness that were welcomed. I’ll be honest, I don’t really like the military style bowls. I feel like I’m camping or something. But, the fried rice was good. Overall, I love the idea of Korean all-you-can-eat, especially for $299!! There are options available, and for the price I think it is reasonable. However, I’d probably be happier paying another couple of hundred for some more options.